A rules meeting to discuss the 2019 season will be held on Sunday, November 11, taking place at the Mahoning Valley Farmers Market, adjacent to the race track. All classes from this season – Modifieds, Late Models, Street Stocks, Sportsman Modifieds, Dirt Mods, Pro 4s and Hobby Stocks will be included in the meetings. We are acknowledging 2 (two) representatives from each team that raced at least once during 2018 to attend the respective meetings. If you are a team that does not fall into that we ask you to please get with one of those who have and pass along your input/concerns or tag along if only one representative will be attending from those who are permissible. We will start the meetings at 10:00 am. ​Meeting order will be as follows: Pro 4 – 10:00 am. Hobby Stock 11:00 am. Dirt Mod 12:00. Street Stock 1:00 pm. Late Model 2:00 pm. Modified & Sportsman Modified 3:00 pm. (MAHONING SPEEDWAY 10-28-18) No practice, no heat laps, no problem for Matt Wentz who capped off his first full season of Late Model racing with his third consecutive win and fourth of 2018. Wentz was a late arrival to the track, making the decision to race at the last minute, thus missing out on practice and his heat. He was relegated to start last for the feature but by lap 16 of 35 was running third behind Jeremy Miller and Brandon Turbush. Miller and Turbush during that time where engaged in a thrilling duel for the lead with very little room to spare between them. When the race’s only caution waved on lap 23, Wentz took advantage of the restart to join in the hunt for the lead with the front pair and using a gutsy inside move he worked underneath both Turbush and Miller for the lead with eight laps remaining. From there on it was smooth and steady sailing en route to his 15th career Mahoning win. Turbush edged Miller for second, his best ever Mahoning finish. Willie Nickerson in his first start at the track was fourth with Todd Ahner notching fifth. Harry O’Neill doesn’t race much at Mahoning Valley Speedway but when he does he’s usually vying for the win and that he did, earning the top spot in the Small Car Enduro. It was only the 10th start here for O’Neill and his fifth win, four others coming in Hobby Stocks. O’Neill zipped into the lead for the first time in the hour long event on lap five over Don Rogers, however, it would be a short lived as heavy traffic all around the ¼-mile made things tricky at times and he would relinquish the position back over to Rogers just two laps later. Rogers didn’t stay long afterwards either, as Kassidy Altemose jumped to the front one lap later and was holding her own nicely despite a slew of bumping and grinding. The young talent was then sidelined on lap 24 when she got taken out of contention. At that point Rogers was back on top with O’Neill and Dan Cascioli close in line. Over the next 50 laps that trio would keep one another in check, Rogers in front while O’Neill and Cascioli continued to swap second. The persistent Cascioli finally got his turn at the lead with 71 laps into the books while Rogers and O’Neill leaned on each other for second. Just past 90 laps O’Neill left behind Rogers and within the next dozen laps zeroed in on Cascioli. Some 100 laps after last leading, O’Neill was back in front but even then things where on the edge as a light mist of rain moved in and made for some slick track conditions. O’Neill played it smart and cautiously the rest of the way and would go on the finish one lap up on the field. Rogers settled for second with Cascioli third. A steady running Tony Rispin was fourth while Jake Oswald drove to a respectable fifth. The Vintage Division of the ATQMRA put on a very competitive show as a nice mix of Sportsman and 2/4-stroke cars made up the diverse field. Winning the event was second generation driver Graham Hughes over veteran TQ racer Tim Adams while multi-time ARDC Midget champion Billy Hughes, father of race winner Graham, was third. Devin Schmidt won a tug of war over Carl Altemose in claiming the win in the Small Car Demo Derby. This concludes the season at Mahoning Valley Speedway. Mahoning Valley Speedway will bring the curtain down on the 2018 season with one final show, Sunday afternoon, October 28. On the docket will be a Late Model/Street Stock Shootout, Vintage TQ Midgets, Small Car Enduro, Jr. Enduro and Small Car Demo Derby. The Late Model/Street Stock Shootout is derived from seasons past when the two classes would run together in a year ending event. This will be a 35 lap feature. Cars must be full fender. Gas or alcohol is allowed and any carburetor. No nitrous. Also any brand asphalt tire will be permitted. The Small Car Enduro will be a timed event paying a guaranteed minimum $600 to win, $300 for 2nd, $200 for third, $150 to fourth and $100 for fifth. Dependent upon the number of entrants that prize money can increase. The cost is $50 per car and $6 for transponder. Enduro rules can be found on the website. The Jr. Enduro will be the undercard to the regular Enduro. The cars will run under the same rules as the Small Car Enduro and most Hobby Stock cars are permissible to compete. Jr. Enduro racers must be between the ages of 12-18. A driver who has more than a year of racing experience in a stock car is not eligible to partake. While a driver of the Jr. Enduro can race on their own, they do have the option to have a passenger seat and an experienced tutor ride along for guidance. The Vintage Division of the ATQMRA will be part of the program as they will contest in separate class heats and a combined feature. TheVintage ATQMRA Organization was formed to preserve the history of three quarter midget racing and is anticipating a respectable group of cars. The Small Car Demo is for “Stock” demo cars. The event will reward a guaranteed minimum of $500, to win, $300 for second and $100 for third. Demo rules will follow that of the West End Fair. The cost to enter the Demo Derby is $25 per car which includes the driver. Pits open at 11:00 am. Race time starts at 1:30 pm. Grandstands open at 12:30. (OCTOBERFAST 2018 - 10-13-18) To fans of eastern Pennsylvania short track asphalt racing the names of Hirschman and Beers are synonymous when it comes to the ranks of Modified competition. For years the two iconic racing families, who both hail from Mud Lane in Northampton, have shared countless headlines, many of those coming in one-two finishes between Mahoning Valley, Dorney Park and Evergreen Speedway’s. Tony Hirschman had gone up against numerous cars owned by the late Dale Beers. Eric Beers and Matt Hirschman took the battle to new heights over the past two decades and on Saturday night at Mahoning Valley during the annual Octoberfast the torch was passed on the next generation as 15-year old Austin Beers showed that he is ready to carry on the duel. In the 150-lap contest M. Hirschman made his racing winning move with four laps to go over A. Beers and claimed the $5000 first place prize. It would be Hirschman’s sixth consecutive victory, 14th of 2018 and 16th at Mahoning, three of them coming in the Octoberfast. But make no mistake all eyes were on the younger Beers who clearly was in route to a monumental victory had it not been for the late caution that dramatically changed the outcome. While most everyone pitted at some point Beers was one of only three others, (Josh Scherer/DJ Wagner), who stayed out the entire race gambling with the same set of tires and it almost paid off. However, when Joey Jarowicz spun four laps from the end Hirschman would use that restart to make his race winning pass with an inside pass off turn two. “That last caution won me the race otherwise Austin Beers was going to win this thing. It was an incredible run that he had. When he was leading and I was second and the race was going on I knew I was settling for runner-up – I wasn’t going to pass him,” bottom-lined Hirschman. “I kept thinking back to my first big win I had at Evergreen (Raceway) at the King of the Green and his dad finished second to me. It was at that moment I thought that how awesome this is and how this kid is going to win this big race just like myself and his dad did in 2001.” Hirschman has been a dominant force everywhere he has run this year and when he brought that winning momentum to Mahoning Valley, his first time at the track in two seasons, the thought was on everyone’s mind as to would his streak go on or could one of the always tough-to-beat Mahoning regulars put it to a halt. For quite some time it seemed as though that would be the case. Pole sitter Austin Kochenash led the early going with Lou Strohl keeping in a close second. Hirschman, who started fifth, joined the front pair by lap eight and thus began a torrid three car battle. After 20 laps Hirschman barely shook off Strohl for second and would then latch on to the back end of Kochenash while Gene Bowers moved to third. Still under tight conditions, Hirschman attempted an inside move for the lead on lap 30 but fell short and made contact with the leader, sending him spinning and several other scattering. He had felt the move was merited at that time as Bowers was looking to get by from the outside. In hindsight, though, he comprehended that it may have been too soon for the endeavor. “I didn’t need to but there was a car that came up alongside me on the outside and it looked like he was going to go by us both. The 66 (Kochenash) was holding me up some and I thought ‘Well it might be time to get ahead of him with other faster cars breathing down my neck,” said Hirschman. “I made an inside move down the front straight and I thought I was in but we don’t race with radios here and that’s kind of how it goes. It was probably not the right move at that time and what the end result was but had I just passed him I might have stayed out the whole race like Austin (Beers) did.” Afterwards Kochenash and Hirschman both pitted while Bowers took control of the race. Scherer and Beers would swap back and forth for second. Kyle Strohl entered into the fray with 50 laps complete. Bowers, who lost in this same race last year by a whisker to Bobby Jones, was looking for redemption and had it going nicely despite that Beers and Strohl where fixated on his rear tail. After numerous two-wide laps with Beers second place fell to Strohl and he began an all-out run at the Bowers, successfully taking over the front spot on lap 94. On the same tour Beers followed and was runner-up. 10 laps later a caution would wave and on that re-go Beers would overtake Strohl for the lead. Through a series of pit stops and hard charging Kochenash had worked his way back to third with 50 laps to go. Likewise Hirschman had motored back into the front five by lap 118. At the helm Beers was showing that he was going to make it tough for anyone to try and pass him. He was very confident in his car’s handling and even disregarded a pre-race team strategy to pit around lap 100. With the laps wearing on Beers was looking closer to becoming an upset winner as Strohl and Kochenash could only watch from second and third. Then on lap 132 the action slowed the action for a minor incident and again three laps later for a spinning car. By then Kochenash had advanced to second and Hirschman made some fancy moves to take third. The pair would then engage a in a dogfight for second and few laps back under green and Hirschman was there. Heading into the waning circuits it was looking more and more as though Beers was on his way to victory until that ill-fated caution waved four laps from the end. “I was definably going to be satisfied with second, no complaints. My experience probably paid off and all I can say is what a future that kid has. Things didn’t quite work out the way I had anticipated early but you never give up,” said Hirschman. “It’s always exciting to be here at Mahoning and it’s never over until the last lap and its fun. I’ll be back that’s for sure.” Strohl was very fast at the end and settled for third with an impressive Scherer taking fourth over Kochenash who rounded out the top five. “My dad wanted me to come in at lap 100 but I was second then and just decided to stay out. The car was great tonight. To be leading one of these event was very humbling against such a stout field,” noted Beers afterwards. “I just ran my own race and if I got beat then so be it. Finishing second to a gut like Matt Hirschman – we’ll take that.” There were 22 cars on hand with Hirschman, Beers and Kevin rex Jr., annexing heat wins. Matt Wentz pulled off a late race pass on division champion Frankie Althouse to claim the laurels in the Late Model feature. Mike Stofflet added his name to the winners of Octoberfast Dirt Mod portion while Corey Edelman was lauded as the Street Stock victor and seasoned veteran Todd Geist won for the second year in a row with the Hobby Stocks. 75 laps would make up the distance of the Late Model main with Althouse and Mike Sweeney sharing front row honors. At the drop of the race commencing green Althouse quickly went to the lead with third starting Wentz and Sweeney in tow.For much of the fast paced show that trio would maintain that order. Althouse, although having the latter two hot on his heels, was keeping them at bay nicely. Sweeney and Wentz did make things exciting at times with double wide racing while keeping up the pressure on the leader. They exchanged spots on lap 36 with Sweeney now looking to unseat Althouse and pick up a third Octoberfast victory. The No. 22, however, was still too tough to get around. Then as the race was winding down a caution flew with just a dozen laps to go. On the restart everything changed as Sweeney lost grip and Wentz drove past him and then kept up the forward motion to make a bold power move past Althouse. For the remaining tours Althouse was absolutely glued to Wentz’s rear bumper. But there would be no change as the checkers waved to Wentz who scored the $1500 verdict and a third 2018 win. Over the past two seasons Mike Stofflet has dominated the Dirt Modified class, winning 20 races and back-to-back championships. When it was announced that the Dirt Mods would be added to this year’s Octoberfast, Stofflet made it the top priority on his bucket list. Stofflet needed only five laps to pass teammate Colton Perry for the lead but he was far from home free. Past Octoberfast winner Ricky Ross Jr., and Jeff Parker where very tuned in to him and raced under a blanket for the better portion of the 50-lap distance. Ross and Parker tried persistently to work over Stofflet but each passing lap he did a perfect job of shielding his spot. As Stofflet reached the finish line Ross and Parker continued to battle side-by-side and would finish just a half-second behind. The Street Stock feature was scheduled to run 75 laps but due to an uncharacteristically more than usual cautions that consumed a long length of time, the race was shortened to 40 laps. For Edelman, it worked out just fine. With Jon Moser on the pole and jumping out to the early lead, it was expected to be a tough run for everyone else as Moser shines when it comes to the extra distance events. Under a lap 13 caution though Moser dove into the pits. A very strong running Edelman was second at the time and elevated to the front for the restart. What then followed was a number of drawn-out cautions. Considering the time restraints and features yet to run, the class was told of the abbreviated length. Edelman had been holding a solid lead when racing finally resumed and would take the big win over Jamie Smith and Randy Schlenker. Todd Geist has been racing for over 35 years although the past few have been sparingly. Despite that when he is in a car he can be counted on to be contending and especially when it comes to Octoberfast. For the second time in as many years the master veteran was the car to beat. He passed Justin Merkel on lap 10 and once in front it was smooth sailing in the $500-to-win 50 lapper. BJ Wambold took the checkers in the Flashback Stocks. (LEHIGHTON 10-7-18) Mahoning Valley Speedway presented by Lehighton Ford and through the efforts of Future Motorsports is proud to announce that national singing talent Tim Marchetto will be preforming the National Anthem for the upcoming Octoberfast this coming Saturday, October 13. A Penn State graduate and independent network consultant by day, Marchetto, a resident of Bethlehem, is no stranger to the stage and lights. He has been performing for more than 20 years and has successfully competed in numerous nationally-themed contests, including the Talent Quest National Singing Championships in Las Vegas (NV). He’s performed throughout the tri-state area as lead vocalist of the legendary group Shake, Rattle & Soul. An accomplished artist and published writer, Marchetto is an avid supporter of local charities such as the American Cancer Society, Toys-4-Tots, Dreams Come True, Cystic Fibrosis Foundation and Juvenile Diabetes to name a few. His talents have blessed him with the opportunities to perform throughout the United States and even as far as Europe. Marchetto was also a contestant on American Idol during season 6 (2007) and was a Hollywood finalist. Race fans will also be treated to a great intermission concert courtesy of the Lehighton High School Marching Band. The 80-plus member ensemble will march out onto the front straight following qualifying and gather at the start/finish line. Under the direction of band leader Bryan Buffington, Director of Bands. Lehighton Area High School, the orchestra will present a 30 minute concert. Also on hand will be the Lehighton High School Indian cheerleaders who will be selling 50/50 tickets, with all proceeds will go directly to the group. Octoberfast 2018 will be Saturday, October 13. Race time is 4:00 pm. The Modifieds will be going 150 laps with $5000 to win. The Late Models are contesting a distance of 75 laps and $1500 for first place. Street Stocks are running 75 laps and $1200 to win. As mentioned the Dirt Mods will compete in a 50-lapper paying $1000 to the victor. The Hobby Stocks will also race for 50 laps with the winner’s take being $500. The Flashback Stocks are also on the card. Modified entry fee is $100. Late Model entry fee is $70. Street Stock entry fee is $60. Dirt Mod entry fee $50. Hobby Stock entry is $30. Pit entrance is $50 per person. There will be early paid practice from noon to 2:00 pm at $25 per car. Regular warmups will take place starting at 2:30 pm with the first round of heats beginning at 4:00 pm. Sign-ins take place from 1:00 – 2:15 pm. A compete purse breakdown will be released soon including contingencies. Mahoning Valley Speedway presented by Lehighton Ford has once again drudged through a weather related weekend as flooding from late week rain forced the postponement of the scheduled Dirt Mods, Small Car Enduro, Jr. Enduro, Vintage TQ and Small Car Demo Derby. Since then there has been revisions made to best accommodate that event. Firstly the Dirt Mods will now be part of Octoberfast on Saturday, October 13. The race will be a 50 lapper and pay $1000-to-win. Any style Dirt Modified is welcome to race including those with sail panels. The race winnings have been bolstered thanks to Mike and Cindy Warden who posted an additional $100 to the winner and promoter Jack Carlino who is kicking in and additional $300. The Enduro and Demo along with the Vintage TQ’s will now take place on Sunday afternoon, October 28. In place of the Dirt Mods will be a Late Model/Street Stock Shootout feature. Race time is slated for 1:30 pm. The Small Car Enduro will pay a guaranteed minimum $600 to win, $300 for 2nd, $200 for third, $150 to fourth and $100 for fifth. Dependent upon the number of entrants that prize money can increase. Because of the setback Enduro entrants can still pre-enter at a reduced cost. The cost for pre-entry will be $40 per car which includes the transponder. Pre-entries must be received or post marked no later than Sunday, October 21. Afterwards the cost is $50 per car and $6 for transponder. Dino Oberto, 211 Columbus Avenue, Hazle Township, Pa. 18202. Entry forms are posted on the website and also available at the track. Enduro rules are posted on the website. The Small Car Demo is for “Stock” demo cars. The event will pay a guaranteed minimum $500 to win, $300 for second and $100 for third. Demo rules will follow that of the West End Fair. The cost to enter the Demo Derby is $25 per car which includes the driver. This coming Saturday, October 6 will be an open practice from noon to 4:00 pm in preparation for Octoberfast. All competitors are welcome to participate. Pit cost is $25 per car (includes driver) and $10 per person. Grandstands are free. Octoberfast 2018 will be Saturday, October 13. Race time is 4:00 pm. The Modifieds will be going 150 laps with $5000 to win. The Late Models are contesting a distance of 75 laps and $1500 for first place. Street Stocks are running 75 laps and $1200 to win. As mentioned the Dirt Mods will compete in a 50-lapper paying $1000 to the victor. The Hobby Stocks will also race for 50 laps with the winner’s take being $500. The Flashback Stocks are also on the card. Modified entry fee is $100. Late Model entry fee is $70. Street Stock entry fee is $60. Dirt Mod entry fee $50. Hobby Stock entry is $30. Pit entrance is $50 per person. There will be early paid practice from noon to 2:00 pm at $25 per car. Regular warmups will take place starting at 2:30 pm with the first round of heats beginning at 4:00 pm. Sign-ins take place from 1:00 – 2:15 pm. A compete purse breakdown will be released soon including contingencies. (9-22-18) Austin Kochenash unwaveringly kept the pressure on Kevin Rex Jr., over the second half of Saturday night’s 35-lap Modified contest at Mahoning Valley Speedway and in the end made a clutch last lap pass out of the final corner to claim the checkers for his first win of the season. The victory was special for Kochenash too who had recently debuted a newly build homemade car. Nicknamed “Frankenstein,” it making just its second race in competition. “This is the first real race with the car and I couldn’t be happier with the way it performed here tonight. To be able to build my own car and win in just the second time out and to get back to winning here is special,” said Kochenash. Zane Zeiner was a close third while Bobby Jones and Josh Scherer completed the top five. With an 11th place tally Brian DeFebo earned his second straight track championship and eighth overall. Pole sitter Rex took to the lead from the outset and immediately had to guard his spot as Zeiner was all over him. By lap 11 Kochenash ousted Gene Bowers for third and would then run alongside Zeiner, both then making continued stabs at the leader. But despite the ongoing battle from Kochenash and Zeiner, Rex remained fully focused in preserving the lead. By lap 19 Kochenash would secure second and begin his offensive on Rex that led to a torrid battle during the final 10 laps. Time and again Rex would close the door then when the white flag waved Kochenash laid it all on the line as he swung to the outside lane and was able to squeeze alongside Rex as they went into turn four. With finish line just feet ahead Kochenash kept the throttle stomped and would nip Rex by the slimmest of margins. “We raced hard and I wasn’t doing anything to move him out of the way. I knew I had a good car to go around the top but then on the last lap I could see that the bottom would be the line and we went for it and here we are,” said Kochenash. “I can’t thank everyone enough, all my sponsors and crew who help me out and I want to dedicate this win to Greg Hodnett.” Rex, who was making just his fourth start of the year, knew it was a tough loss but took it in stride none the less. “The car started out pretty good but towards the end it began losing bite coming off the corners. Austin (Kochenash) ran us good and it was a great battle at the end,” said Rex. For Mike Sweeney and Frankie Althouse, the final point race of the season with the Late Models was nerve wracking to say the least. Althouse began the night with a 10 point edge over Sweeney who is the two-time and defending champ which made every finishing spot vital. For Sweeney he could not afford to leave anything on the table and set his sights on the big prize of winning. And, it didn’t take him long to seize the lead which he did after a lap five restart. However, Althouse advanced his way to second soon after and would then follow Sweeney the rest of the way. Sweeney would take the checkers for his second win of 2018 but the runner-up tally by Althouse would give the long-time supporter of Mahoning Valley his career first championship by a difference of just three points. 26 years ago Eric Beers battled Earl Paules for his first Modified championship. Fast-forward to Saturday night and Paules was again going for a title against a Beers only this time it would be with the Sportsman Modifieds and with Eric’s 15-year son Austin Beers. As to be expected the night began with thrilling drama as A. Beers started out just two points better than Paules. When the heat was concluded Paules garnered enough markers to begin the feature two points to the good. When the race got underway BJ Wambold was holding the lead while Beers and Paules race second and third. Beers knew what his best title option was and going for the win and during the first 14 laps he would make every effort to get past Wambold. Then with a restart on lap 15 Beers took that at his best time to strike, motoring to front from the outside. For the remaining 10 laps he then put enough of a gap on the rest of the pack to secure the victory and earn the inaugural class championship. Jamie Smith raced out front for all 30 laps of the Street Stock feature, in the process picking up his first win of the season over Stacey Brown and Jason Beers. In the tightly contested battle for the division crown Mark Deysher’s fifth place finish was enough needed to win his third division championship. Mike Stofflet was the man to beat throughout the season with the Dirt Mods and proved yet again with his seventh victory. Stofflet passed a very determined Billy Sittler Jr., halfway through the race and went on to score not only the verdict but a second straight championship as well. Jake Kibler bookended the Pro 4 season with victories and added two in-between, giving the veteran racer his first championship after 27 years of trying. The race was a thriller as Kibler unremittingly chased behind Cody Kohler starting at lap seven. Then on the final go-around Kibler was glued to the back of Kohler and exiting turn four made a go-for-broke move to the inside and eked out the win that was measured just .002-second. Cody Boehm and Devin Schmidt put on an amazing duel in the Hobby Stocks as they ran in two-wide formation over the second 10 laps. Going toe-to-toe Boehm, a rookie, was scored in second on the final tour but with girt and determination he squeezed out enough power to nip Schmidt for the popular win. Michael Wambold’s fifth place gained him the class title and in doing son joins his infamous father, “The Legend” George Wambold and brother, Brian Wambold as a Mahoning champions. (LEHIGHTON 9-15-18) Brian DeFebo picked up his fifth win of the season and in doing so essentially put himself in line for a second straight track championship. DeFebo came from 12th on the grid and during a two lap period worked his way past Earl Paules and Ron Haring Jr., to advance into the lead. With 10 laps remaining thereafter he would wrangle off his top point opponents Kyle Strohl and Bobby Jones in securing his 14th Modified victory at Mahoning Valley. “The best way to win this championship is to just do what we’ve been doing all year and that’s come out here and win,” said DeFebo. The race didn’t exactly come to DeFebo until the first caution had waved 9 laps into the 35-lap event. During those nonstop laps Haring Jr., was setting a great pace while fending back Paules. Gene Bowers was running third with Nick Baer fourth. DeFebo had advanced to fifth by lap 11 but with the torrid pace progressing on by Haring it was a demanding order to make headway. When the action was halted for a Kristy Arthofer spin on lap 19, Haring would be on his toes during the restart to not allow Paules the chance to work by him. DeFebo, however, used that opportunity to move by Bowers. With Paules now in his sights DeFebo would swoop underneath him on lap 24 in turn 4 and the next time around would replicate that same tactic on Haring for the lead. “The car was good both high and low and I saw the opportunities tonight to go to the bottom and it worked in our favor,” explained DeFebo. “I was trying to be protectively cautious and keep a little gap in case something happened during that long green flag run. Then when the opportunity arose I knew I had to go. I want to win races and we do this to win races and we’re having fun doing it.” Strohl and Jones combatted in a fierce dogfight over the final laps while both pursing DeFebo. Haring Jr., capped off his great run at the front with a very respectable fourth while Paules rounded out the top five. Matt Wentz gave his Hall of Fame dad Gary Wentz a great birthday gift by scoring his second Late Model win of the season. Wentz whizzed by Dylan Osborn on lap 11 and then withstood a very insistent Paul Koehler Jr. for the win. With just one regular season race to go Frankie Althouse has moved to the top of the standings after the night’s point leader when the evening began, Mike Sweeney, suffered his first DNF due to a whack on the front straight wall and would finish last. Althouse takes a 10 point difference heading into next week finale. The Street Stock feature was nothing short of amazing and despite Cody Geist being shown as leading all 30 laps it was hard-fought from start to finish. Geist was blitzed by Mark Dysher and Jared Ahner who ran side-by-side behind him. Several times Dysher tried to pull next to the leader but each time his efforts were spoiled by the much focused Geist. Not only where the top trio blazing their way intensely around but Todd Ahner and Reichenbach where just as much in the mix. The race would come right down to the wire too as Geist came off the final corner and nearly got loose. With his car almost sideways he held on to beat Dysher by a .142-second margin. As a tribute to his close friend who had just passed away, Geist dedicated the victory to Marc Carazo. Ricky Yetter may concede that Mike Stofflet is in the driver’s seat for a second straight Dirt Mod title and with that said he had his focus on going out and doing the only other thing possible – win. That he did and it was a battle for the ages as he would have Stofflet breathing all over him during the caution free run. Stofflet leaned heavily on Yetter but “The Law” would never waver as held on for his third verdict of the season. Bobby Kibler Sr., raced to a second straight Pro 4 win, this one in a special $400-to-win feature. The race was originally slated for 40 laps but under the time rule it was checkered at 27 laps. Kibler Sr., made his way to the lead just three laps from the calling of the race and would be able to hold off Tyler Stangle who would earn his best run to date. When Peyton Arthofer, with certainty, raced to her career first stock car win in the Hobby Stock main, she unsuspectingly became part of some unique track history. By winning she joins Avery Arthofer as the only sisters to ever win a features at Mahoning. And, she, Avery and mom Kristy Arthofer are the only mother/daughters to every win features as well. She is also the eighth different member of her infamous family to win a main event at the track. rthofer drove seamlessly throughout the 20 lapper and beat Shawn Kistler by nearly 4-seconds for the always to be treasured victory. Mahoning Valley Speedway presented by Lehighton Ford heads into this coming Saturday, September 15 with six track classes of stock cars plus the thrilling TQ Midgets of the ATQMRA. Race time is 6:00 pm. No sooner was last Saturday beginning to shape up with a full pit, Mother Nature rained down – literally – and forced the cancellation for the night. It was the 10th such time that rain kept things quite at the paved ¼-mile Lehighton oval. But, just as they have all season long, the always optimistic management team of Mahoning Valley looked ahead and concentrated on the next event and beyond. That said it’s all systems go for a night of Modifieds, Late Models, Street Stocks, Dirt Mod, Pro 4s and Hobby Stocks. The Pro 4’s will be running a 40-lap/$400-to-win feature. Additionally the open cockpit speed demons of the ATQMRA will contest in a 25-lap main event. After veteran Joey Payne’s win two weeks ago at Wall Stadium, he became the seventh different driver in nine 2018 events with the popular touring club and making this one of the most competitive seasons in the 62 year history of the club. Pit gates will open at 11:30. Early paid practice begins at 12:30 and goes to 3:30. Regular warmups start at 4:30. Adult grandstand admission is $12. $2 off for students, seniors 65+ and active military, children under 10 are free. Front gates open at 4 pm. Coming up on September 22 will be the final night of points for all classes. Mahoning Valley Speedway presented by Lehighton Ford will conclude the regular season and crown the 2018 division champions on September 22 with its final day of points. The stocks cars, primarily the Modifieds, Late Models, Street Stocks and Hobby Stocks, will then begin preparation for the annual Octoberfast on October 13. But that doesn’t mean any downtime in between for the popular ¼-mile paved Bullring. On September 29 at 2:00 pm the track will have a diverse line-up of on and off track action taking place. Dirt Mods, Small Car Enduro, Jr. Enduro and Vintage TQ Midgets will be running feature events on the speedway while a Small Car Demo Derby will be filling up the infield. In what has been a great turnaround year for the Dirt Mods, the exciting class that brings a unique brand of racing to the pavement will be having a special 40-lap/$600-to win feature. Likewise the Vintage Division of the ATQMRA will be part of the program as they will contest in separate class heats and a combined feature. The Small Car Enduro is a timed event that will pay a guaranteed minimum $600 to win, $300 for 2nd, $200 for third, $150 to fourth and $100 for fifth. Dependent upon the number of entrants that prize money can increase. The Jr. Enduro will be the undercard to the regular Enduro. The cars will run under the same rules as the current Small Car Enduro and most Hobby Stock cars are permissible to compete. Racers must be between the ages of 12-18. A driver who has more than a year of racing experience in a stock car is not eligible to race with the Jr. Enduros. While a driver of the Jr. Enduro can race on their own, they do have the option to have a passenger seat and an experienced tutor ride along for guidance. The Jr. Enduro class made its debut in 2016 and won by Avery Arthofer. Enduro drivers who pre-enter before September 22 can save money too. The cost for pre-entry will be $40 per car which includes the transponder. Pre-entries must be received or post marked no later than Sept. 22. Afterwards the cost is $50 per car and $6 for transponder. Entry forms are posted on the website and also be available at the track. Enduro rules can be found on the website. The Small Car Demo is for “Stock” demo cars. The event will pay a guaranteed minimum of $500, to win, $300 for second and $100 for third. Demo rules will follow that of the West End Fair. The cost to enter the Demo Derby is $25 per car which includes the driver. Also, if the track receives 10 or more Big Car Demo Derby entries by September 22 then they too will be added. It will be $500 to win and $200 for second plus top three to receive trophies. Jeremy Miller came into the 2018 season with a personal objective of challenging for the class title and over the second half of the year he has been making a firm statement towards that goal as for a second consecutive week and fourth time this season he parked his No. 98 in the Winner’s Circle. It wouldn’t be until the only caution of the race that Miller was thought to have a shot. Prior to that the race was in the hands of pole sitter Dylan Osborn who was maintaining a steady pace ahead of Jacob Kerstetter and Matt Wentz. However, on lap 17 contact between the later pair shuffled the field as drivers where taking evasive action to avoid the tangle. When the field was reset Kenny Hien was alongside Osborn with Miller third. No sooner did the first lap back under green take place Miller was sneaking underneath both of them and driving into the lead where he would stay to the checkers. Frankie Althouse and Mike Sweeney took second and third respectively and although those two are ahead of Miller in the points, the victory assured him as a prime championship contender. The Street Stocks put on a special 75-lap feature that was fast paced for most of the event thanks to just one caution. That meant hard racing for the lead and Jon Moser was doing that and more. Moser was dogging Rick Reichenbach for the better part of the first 25 laps, many of them in a near side-by-side battle. With 28 laps in he finally poked his nose ahead and after clearing him for good it was game over. Neither a restart on lap 41 nor anything else stood in Moser’s way as he went unopposed the rest of the way. The win, his second this season and 33rd of his career, was worth a cool $1000. Jared Ahner and Randy Schlenker battled together for runner-up honors with Todd Ahner and new point leader Mark Deysher rounding out the top five. Austin Beers picked up his third Sportsman Modified and in the process unseated Earl Paules for the division point lead with two races to go. Beers ran side-by-side with Kassidy Altemose for a pair of laps before locking in the lead on lap four of 25. Paules was up to second and did make a run at Beers but he would later slip back and on the final lap watch as Altemose would run underneath him and claim a career best second. Dirt Mod point leader Mike Stofflet is looking more and more like a repeat champion as he raced a cut above the rest in picking up his sixth victory of 2018. Stofflet shot to the lead on the opening tour and was never headed the rest of the way. Billy Lowden Jr., was trying to make a run near the end but with no time on his side he would have to settle for second. Bobby Kibler Sr., broke the hold on winning between Cody Kohler and Jake Kibler in the Pro 4s as he notched his first win of the year in a flag-to-flag effort out front. B. Kibler held off a hard charging J. Kibler for his first win in three years. For a time during the Hobby Stock feature it was appearing that Lyndsay Buss was poised to win her first main event as she led from the outset and had the upper hand on the field. However, a restart on lap nine would see her chances dashed as Just Merkel used the outside lane to drive past her. He would then hold the lead the rest of the way while fending off a very determined Peyton Arthofer in-route to his second career verdict. “It was really tough out there because we were so equal. I’m really proud of my guys after coming here tonight and struggling in our heat,” said Zeiner. “The car wasn’t right and we made a phone call to (crew chief) Barry Kuhnel and he hit it right on the dot. We’re really looking for big things down the road here.” L. Strohl settled for a solid third with Kochenash and Wagner rounding out the top five. In the Late Model feature Jeremey Miller has added win number three to what has been his best season to date with the class. Jacob Kerstetter would jump out front early on while Miller was busy contesting second spot with impressive teenager rookie Samantha Osborn. Needing nearly 10 laps to shake free, Miller then set his sights on Kerstetter and began a thrilling double-wide battle for the lead. By the time they crossed the stripe to complete lap 15 of 25 Miller had eked his way to the front and from then on stayed the course and went on to a two-car length margin of victory over Mike Sweeney who has just nipped Kerstetter for second at the checkers. Matt Schlenker became a winner in just his fourth ever Mahoning start, earning the verdict in the 30-lap Street Stock run. The race was very exciting to say the least as the lead battle was intense. Schlenker would take the control on lap two from Jeremy Scheckler but soon after was battling Rick Reichenbach and Jon Moser. Both would get by Schlenker on lap nine and they then engaged in a stifling fight for the lead. Side-by-side between Reichenbach and Moser made for some rousing moments and all the while Schlenker was in their shadow. With six laps remaining Reichenbach and Moser where locking horns and opening up a lane on the bottom. Without hesitation Schlenker seized the opportunity and went underneath Reichenbach. There was some contact that saw Reichenbach made an incredible save. Schlenker meanwhile sprinted off to the unforgettable victory. In the Dirt Mods it was Ricky Yetter taking the win, his second of the season. Yetter blasted by pole sitter Colton Perry on the opening circuit and then held off a hard charging Billy Lowden Jr. en-route to victory. Pro 4 standings leader Cody Kohler notched his fifth win in nine 2018 starts and in the process padded a slim point lead over second place finisher Jake Kibler with just three races remaining. Kohler led all 20 laps although Kibler who chased him for most of the distance. Top five finishes have not come easy this season for Beau Drobot, only three to be exact but when they have its notable as each one has been in the form of a win including Saturday night. Drobot claimed his class-high third Hobby Stock verdict of the year, doing so by leading every lap. His next top five may not be coming right away, however, as right after the race Drobot noted that the car was sold. Rich Mutarelli was closing near the end and registered a well-earned second. Mahoning Valley Speedway presented by Lehighton Ford will be in action this upcoming Saturday, August 18 with the main event being a 75-lap/$2500-to-win Modified feature. This is a non-point race, however there will be 50 show-up points to each driver. Drivers will pick for heat starting spots when signing in. The top 3 from each heat will then have a redraw for feature grid positions. As an additional bonus the top heat winners will compete in a special “Dash Cash” with a winner-take-all $500. Up to four heat winners will be eligible, however, if only three heats are run then the final entrant will be by promoter option. Also on the night’s race card will be Late Models, Street Stocks, Dirt Mods, Pro 4s and Hobby Stocks. Pits will open at 11:30 am. Early paid practice ($25 per car) will be from 12:30 to 3:30. Regular warm-ups begin at 4:30. Pit admission for this night is $30 members, $40 non-members. Driver sign-ins will be from 3:00 to 4:15. Adult grandstand admission is $16, $2 off for students, seniors 65+ and active military. Children under 10 are free. Front gates open at 4 pm, racing begins at 6:00 pm. This Saturday, August 11, the racing line-up will be Modifieds, Late Models, Street Stocks, Dirt Mods, Sportsman Modifieds and Hobby Stocks. Adult grandstand admission is $12. The Kids 5th Annual Back 2 School Backpack Giveaway is currently underway. Karen Bortz has been doing this giveaway for over four years and the younger set really look forward to it. Please see Karen to help with a backpack. The upcoming Modified $2500-to-win/75-lap feature on August 18 will be a non-point feature. There will be 50-showup points. Drivers will pick for heat starting spots when signing in. The top 3 from each heat will then have a redraw for feature grid positions. We will also be having a “Dash Cash” with a winner-take-all $500! There will be 4 cars to run for the cash. Each heat winner will be in. If only three heats are run then the final spot will be by promoter choice. Thanks to Jack and Rebecca Carlino for putting up the bonus money. In other news we have been getting a lot of input about doing an Enduro and your voices have been heard. With that said we are going to hold an Enduro on Saturday, September 29 at 2:00 pm. We highly encourage drivers to pre-enter and save $$. The cost for pre-entry will be $40 per car which includes the transponder. Pre-entries must be received or post marked no later than Sept. 22. Afterwards the cost is $50 per car and $6 for transponder. Entry forms will be posted on the website and also be available at the track. Rules will be updated on the website but rest assured they are similar to previous years. As of now we will be paying the Small Car Enduro $600 to win, $300 for 2nd, $200 for third, $150 to fourth and $100 for fifth. The Jr. Enduro and Big Car Enduro payout will be set soon. And yes we’ll be planning on conducting a Demo Derby too. On Friday, August 17, Blue Mountain Quarter Midget Club located at 4667 W Mountain View Dr., Walnutport, will be holding their annual Benefit Night. This is always a great night to not only watch the future stars of racing but help out a great cause. This year’s charity will be the Cystic Fibrosis Foundation. There will be a basket raffle, race cars on display and features only in action. Don’t forget track rental is available for $150 for a 4-hour period. Contact Jack Carlino or Dino Oberto if interested. Mahoning Valley Speedway may have been dealt another setback with last week’s weather cancellation, the seventh such of 2018, but track management remains focused on continually looking ahead to the next program and beyond. The calendar of events now shifts to August 11 at 6:00 pm, as Saturday night stock racing presented by Lehighton Ford will see six divisions in action. Modifieds, Late Models, Street Stocks, Sportsman Modifieds, Dirt Mods and Hobby Stocks running a complete set of heats and features. The following week, August 18, the Modifieds will be racing in a special 75-lap/$2500-to-win feature. This show was originally slated on April 28 but in what has been somewhat the norm, weather forced the postponement until a feasible date could be found. This race has been deemed as a nonpoint event, however, 50 ‘show-up’ points will be awarded to all drivers. A draw for heat starting spots will take place. Afterwards the top three from each qualifier will redraw for feature starting spots. And, there is now an added bonus. Promoter Jack Carlino is tossing in a $500 winner-take-all windfall in a special 4 car Dash Cash run. This will consist of heat winners running in a 12-lap dash. If only three heats are contested then the final entrant will be by promoter’s option. It was also announced that there is interest in an Enduro and Demo Derby. As of now the speedway is tentatively planning on Saturday afternoon, September 29 as the date. An entry form will be posted ASAP on the track website for the Enduro and Demo Derby with all information. 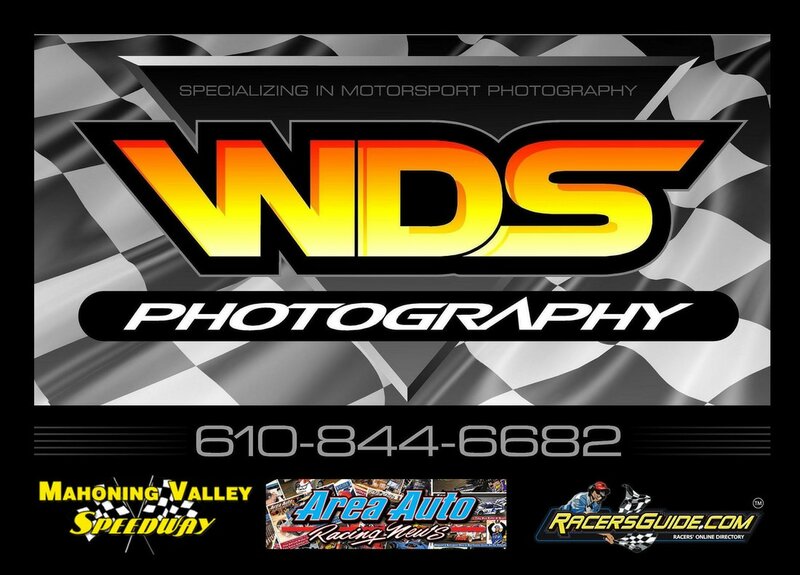 For additional news and updates log onto www.mahoningvalley-speedway.com or Facebook. 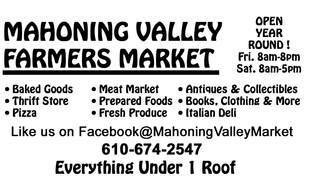 Mahoning Valley Speedway is located just a few miles west of Lehighton on PA 443 and is adjacent to the Mahoning Valley Farmers Market. In what has become a recurring scene more times then not this season at Mahoning Valley Speedway, Mother Nature has struck again as the races for August 4 have been cancelled due to rain conditions. Despite knowing that the weather will clear later today, track officials have little choice but to pull the plug on the night of racing because of excessive flooding and saturated grounds. “This is very unfortunate for everyone from our fans, teams and marketing partners to have to deal with another blow like this,” said general manger Dino Oberto. “We were gearing up for a great night with our Summer Slash $8 pack the track night. We had several new cars coming in tonight but water from the overnight rain and flash flooding has inundated much of the track surface and staging area. Even though we know our crew can get the job done of pumping out all that water we still have the issue of seepage.” This will mark the seventh rain cancellation this season. Next week, August 11 will be a six division program consisting of Modifieds, Late Models, Street Stocks, Dirt Mods, Sportsman Modifieds and Hobby Stocks. On August 18 the Modifieds will be contesting in a 75-lap/$2500-to-win feature. This race has been designated as a nonpoint event, however, 50 ‘show-up’ points will be awarded to all drivers. A draw for heat starting spots will take place. Also on the schedule that night will be Late Models, Street Stocks, Dirt Mods, Pro 4s and Hobby Stocks. In other track news Mahoning Valley Speedway is looking to run a special Enduro and a Demo Derby on September 29. Information with details will be out soon. (July 28, 2018) Brian DeFebo added another feather in his already filled hat of career racing accomplishments, this one coming in a milestone achievement by scoring his 100th overall feature win, coming in Saturday night’s Modified main at Mahoning Valley Speedway. In the previous Late Model race Frankie Althouse came in as the point leader and also looked ready to pad that lead with a shot at winning the night’s 50-lap main. Unfortunately Althouse’s luck turned sour when he was caught up in an accident and suffered significant damage. Mike Sweeney won that race and assumed the lead in the standings as well. Althouse and Company showed their resilience though, making all the repairs to be race ready in short order. The hard work paid off too as he picked up his third win and the reward also hurdled him back into the top point placing. Althouse was locked in a torrid battle for second with Matt Wentz until lap 12. After finally attaining the position he then set his sights on leader Kenny Hein, who was driving a superb race. Without the help of cautions as the race went nonstop, Althouse went side-by-side with Hein and raced his way past on lap 15. The rest of the way he remained perfect. Hein settled for a very respectable second with Wentz third. The Street Stock feature was in the hands of Todd Ahner just past midrace and it looked as though it would stay that way but on the final lap Randy Schlenker made a daring inside pass in the final two corners and won his first race in just four starts this year and netted his first Street Stock win at Mahoning Valley in 18 years. Austin Beers for a second time held off Earl Paules in a thrilling battle Sportsman Modifieds. Beers led from the outset and would have to contend with Paules virtually every lap on route to victory. In the 20-lap Pro 4 feature Jake Kibler bided his time behind Bobby Kibler Sr., in a very tight fight. Then on the white flag circuit J. Kibler waited no longer and executed a heart stopping pass which earned the veteran ace his 30th career Pro 4 win. When promoter Jack Carlino announced that he was tossing in an extra $150 to win the regular 20 lap Hobby Stock feature all drivers wanted to cash in. But none more than Trisha Connolly who after passing Lyndsay Buss two, showed that she would be the car to beat. Connolly was just too tough on this night and went on to notch her second win of 2018. (LEHIGHTON 7-17-18) With the second half of the 2018 season well underway much of the action at Lehighton’s Mahoning Valley Speedway sponsored by Lehighton Ford is focusing on points. This coming Saturday evening, July 21, a six division show of stock car racing at the paved ¼-mile oval will be centering on the close championship battles. The action will consist of Modifieds, Late Models, Street Stocks, Dirt Mods, Pro 4s and Hobby Stocks. Brian DeFebo, fresh off his third win of the year is maintaining the lead in the headline Modified class but hot on his heels are Bobby Jones, Kyle Strohl, Earl Paules and John Markovic who remain within close reach of the defending champ. With his first win of the season coming in last week’s 50-lap feature, two-time and defending Late Model champion Mike Sweeney has moved ahead of Frankie Althouse in the division standings. But, not to be taken lightly is Jeremy Miller who is just a few points behind the lead pair. Equally in the thick of things are Jacob Kerstetter, Paul Koehler Jr., and Kenny Hein. Cody Geist was the Opening Night Street Stock winner and since then has been consistent with 8 out of 9 top five runs which has enabled him to ride the top spot thus far. Mark Deysher is hovering in his shadows along with Corey Edelman, Stacey Brown, Jared Ahner and Jillian Long who are all within 55 points. Mike Stofflet has been the hot ticket in the Dirt Mods to date, winning his fifth race in eight starts last Saturday. Although he has proven the car to beat there is Ricky Yetter and Billy Lowden Jr., who are keeping him within their sights. The Pro 4 class currently has 2015 champion Cody Kohler as the point leader heading into this week’s race meet but keeping him honest along the way has been his top rival Jake Kibler at a mere 19 markers back. The best battle currently goes to the Hobby Stocks. Tied at the top are Michael Wambold and Ryan Berger. Another 12 behind is Al Arthofer while Peyton Arthofer, Travis Solomon and Trisha Connolly are all close enough that any of them can jump to the top with a good outcome. There is an incentive of an additional $150 to the Hobby Stock winner this Saturday too. Adult grandstand admission is $12, $2 off for students, seniors 65+ and active military. Children under 10 are free. Front gates open at 4 pm, racing begins at 6:00 pm. There is also a $2 discount with a Big Diamond Speedway wristband from the night before. Pit gates open at 11:30 am with early paid practice ($25 per car) running from 12:30 – 3:30. Pits are $25 for members and $35 for non-members. Regular warm-ups begin at 4:30. Driver sign-ins will be from 3:00 to 4:15. (JULY 14, 2018) Brian DeFebo wrapped up a great weekend, winning his second Modified feature in two days. Fresh off a Friday night verdict at Evergreen Raceway, DeFebo was able to continue on his winning ways Saturday evening at Mahoning Valley Speedway. The seventh starting DeFebo would make quick work of Joey Jarowicz in taking the lead on lap 15. From there on he remained smooth as he held off Bobby Jones for his third win of the season and registered his 99th overall career win.“We’re at 99 (wins) now and it’s exciting. I love racing here at Mahoning Valley. For years it was a struggle but these past two years it’s been nothing but fun,” said DeFebo, who continues to maintain the class point lead and seeks a second straight championship.“I can’t thank (crew chief) Gary Slusser enough. He’s the brains behind this deal. He spends countless hours and from that we have good race cars.” At the onset Ron Haring Jr., jumped into the lead but had unceasing pressure coming from Jarowicz. Haring also had to contend with Jones who was giving him much of the same opposition on his outside.For Haring it was full defensive mode as several times Jarowicz was able to stick his nose inside the leader while at the same time doing whatever necessary to fend off Jones. Unfortunately it all came to a head on lap 13 when the No. 85 got tripped up just past the start finish line and went spinning from the lead.On the restart Jarowicz was shown as the new leader over Jones and DeFebo. Just one lap after the race restarted, DeFebo made his race winning move by going to the low side in whizzing to the front. Jarowicz and Jones continued a great dogfight to the end with Jones getting the runner-up spot. John Markovic and Gene Bowers rounded out the top five.“There wasn’t much racing on the outside tonight so we had to adapt and take down low,” said DeFebo. “Once you get into the lead you then have to go into a defensive style of driving. We have good group of drivers down here and they all race you hard and clean. ”Up until last evening, two-time and defending Late Model champion Mike Sweeney had led just a single feature lap and was winless in the process. With a big 50-lap race on tap Sweeney was looking to turn the tides and did just that. After a great lead battle with Frankie Althouse that began on lap 20, the Ford powered No. D11 of Sweeney was able to plant himself at the helm by the halfway mark and from there on never looked back, scoring his first win of 2018 and 55th overall. “First of all I have to thank my crew who work their tails off week in and week out to get this car right,” said Sweeney.“Frankie is has been fast and we’ve been trying to catch him and there is bunch of other guys who are all coming on strong this year so we have to go and do our homework in order to win and finally tonight it paid off.” In actuality Sweeney has been having a good year, finishing each race in the top five which included three runner-ups. It was just the big prize that until now eluded him. That now done he also took control as the new class point leader.The race started out with Kenny Hein showing the way and doing a great job of holding back Althouse and Sweeney. Through the first 19 laps the race was all in his hands then Althouse was able to get by and took Sweeney with. That dual would then run hard amongst themselves with Sweeney winning out by lap 25. For Althouse, who came into the night as the point leader, his night came to an sudden end when he was caught up in an accident six laps from the end. Jeremy Miller, Paul Koehler Jr., Hein and Brandon Turbush would complete the top five. In the Winner’s Circle for the Sportsman Modified feature it became a very emotionally charged scene as 15-yeat old Avery Arthofer had just notched her first win with the class and was greeted by her entire family with hugs and tears of joy. A previous winner in Hobby Stocks, Arthofer is in her first season with the Sport Mods and in the race was able to fend off track kingpin Earl Paules for the memorable victory and caring on a family legacy of winning at Mahoning Valley. Corey Edelman ran side-by-side with BJ Wambold over the first half dozen laps off the Street Stock main and then used the next time by to advance into the lead and go on to record his second win of the season. In the Dirt Mods point leader Mike Stofflet once again was the car to beat. Stofflet got by the continuously improving Vince Fegley Jr., for the lead on lap four and then held off hard charging Billy Lowden Jr., for his fifth win in eight starts. In both he Street Stock and Dirt Mod features Indy Car star Sage Karam raced and held his own nicely, especially in the Dirt Mod show where he was looking to secure a fourth place spot before a cut tire relegated him to seventh in the final run down. Al Arthofer needed just one lap to hustle the lead from Tad Snyder and then stayed strong to the finish in picking up his second Hobby Stock win of the year over a close running Ryan Berger. The last time Sage Karam was strapped into a race car he was doing so at lap speeds in excess of 225 mph at the “The Greatest Spectacle in Racing” running in the 2018 Indianapolis 500 presented by PennGrade Motor Oil. At this year’s 102nd edition of the world’s most famous auto race, the 23-year old from Nazareth drove No. 24 WIX Filters/DRR Chevrolet to a 24th place finish. It would mark his fifth start in the 500. The next time he goes racing will be a bit extreme from Indy as he is set to run Ricky Yetter’s No. 5 Dirt Modified at the ¼-mile paved bullring Mahoning Valley Speedway in Lehighton on Saturday evening, July 14. By contrast, Karam will be introduced to a whole new style of speed and driving as there is little comparison between an Indy Car and Dirt Modified. Given his talented background however, it shouldn’t be hard to make the transition for the versatile Karam. He is a National Karting champion with over 36 titles. Having started racing at age 7, he is the only driver to ever win the Indy Racing League Stars of Karting and the World Karting Association’s Triple Crown in the same year. He has a record of 29 National Championships and 9 Consecutive National victories. In 2013 he raced to the Indy Lights Presented by Cooper Tires championship. Karam has also competed in the IMSA WeatherTech SportsCar Championship Series. Yetter, who is the 2015-16 Dirt Modified division champion, made the deal with Karam just recently when his son was taking part in a wrestling camp being conducted by Karam’s father, Jody. Sage was also there serving as a coach. “I’m very excited for the opportunity to drive Rick’s car and look forward to racing at Mahoning Valley Speedway. The track is just a short drive from our house,” said Karam. “I’ve seen some cool video of the races there and it’s definitely unique in its size. I’m looking to come out and have a fun evening.” Karam plans to get a day of testing in prior to his July 14 Mahoning debut. Yetter will be tutoring him every step of the way. “I think this is a great opportunity to have a driver of Sage’s caliber race at Mahoning Valley. He is a great talent that has raced all over the country and beyond. We’re very excited to put him in the seat of our Dirt Modified. To think that one of the stars of the stars of the Indy 500 will be racing with us will make for a special night for everyone,” said Yetter. That same night Mahoning Valley will present a complete show of Modifieds, Late Models, Street Stocks, Sportsman Modifieds and Hobby Stocks plus the Flashback Stocks, vintage stock cars, will be in action. The Late Models will be running in a special 50-lap/$1200-to-win main. Adult grandstand admission is $16, $2 off for students, seniors 65+ and active military. Children under 10 are free. Front gates open at 4 pm, racing begins at 6:00 pm. There is also a $2 discount with a Big Diamond Speedway wristband from the night before. ​(JUNE 30, 2018) It came as no surprise that a season high 24 Modifieds came out to be part of the 2nd Annual Bill Teel Memorial Modified 4-16s. Teel, a past 3-time champion and car owner champion, made an indelible impression with so many people. It was evident by the wonderful turnout both in the pits and grandstands. The event is unique with four 16-lap features – that being the signature car number run by Teel throughout his career. The quick stints made for some thrilling action and outcomes which is exactly how the night panned out. After all was said and done Kyle Strohl, James Pritchard Jr., Tyler Haydt and Joey Jarowicz took respective checkered flags while John Markovic was declared the overall winner by virtue of his average finishing place across the four mains. Matt Wentz breezed easily to his first ever Late Model win. A seasoned veteran of Mahoning Valley and winner in various classes, Wentz grabbed the lead at the outset. He was then set on cruise control running fast, smooth and steady all 25 caution free laps. Mike Sweeney was second but never able to get close enough to mount a serious challenge. Jared Ahner has shown that when he’s on he is tough to beat. That was indeed the case in racing to his second Street Stock victory of the season. Ahner took the lead from pole sitter Ken Erney III as the race commenced and then let everyone in his dust as lap after lap he moved further ahead of the pack. The win also came with a bonus as an additional $200 was paid plus an American Racer tire went to the winner. In Pro 4 action Jake Kibler held off point leader Cody Kohler in a solid battle for his second win of the season. June 30, 2018 is a date that will long be remembered by Justin Merkel as he recorded his career first feature win with the Hobby Stocks. And he did it in fine fashion by sweeping the night leading every lap in his heat and likewise over the 20 lap main. On Friday night’s Big Diamond Speedway, the 3/8-mile dirt oval in Forestville puts on a great show of stock car racing. Saturday’s at the paved ¼-mile oval Mahoning Valley Speedway in Lehighton the same can be said. Each track can boast their own unique brand of action that always leaves fans coming back for more. Separated by a mere 36 miles, familiar faces can also be seen in both grandstands as numerous buffs like an equal amount both dirt and asphalt racing. Looking upon those prospects Jake Smulley, promoter of Big Diamond and Mahoning Valley’s Jack Carlino have made a commitment to offer spectators a $2-off discount when showing their respective front gate wristbands. Starting this Friday fans from Big Diamond can attend the next night at Mahoning Valley and take advantage of the $2-off deal. Likewise Saturday’s wrist bands from Mahoning Valley will offer the same discount the following Friday at Big Diamond. Please note that the wristband offer is can only be used on a per-week basis and not carry over an additional week. And, the special offer couldn’t start at a better time as both tracks have big nights planned. This Friday night at Big Diamond Speedway the 2nd annual Dave Kamp Memorial Night will see plenty of bonus money available to racers in all four divisions. The Mattera’s Electrical and General Contracting Modified division will compete in a $4000 to win feature. Additionally there will be a $300 to win Dave Kamp Memorial Cash Dash for the night’s heat winners sponsored by Red, White and Blue Auto Sales. In the USS Achey Sportsman division, the winner of the 20-lap feature event will pay a total of $1300 thanks to a $300 bonus courtesy of Pioneer Pole Buildings. A $100 bonus will be given to the halfway leader of the feature sponsored by Ric’s Service Center of Palo Alto. A $150 hard charger bonus sponsored by Ed’s USA Auto Rental will also be available. The Savage 61 Road Runners will race for a total of $608 thanks to a $158 feature winner bonus sponsored by Greg’s Auto Service and Collision. The No Sweat Service Group Street Stock division will race for a payout of $900 to win. Included in that amount is a $400 bonus sponsored by Ken’s Tire. Gates open at 5:30pm with warmups starting at 7:30. Friday’s general admission is $20, kids 10-11 are $10, under 10 free. Senior admission is $18 and as always active Military with ID are free. Mahoning Valley Speedway is proud to announce that the second running of the Bill Teel Memorial Modified 4-16s will be held on Saturday, June 30. Teel passed away in 2012. He won Modified titles in 1988, 1990 and 2000. He was also the 2011 Modified car owner champion with Tyler Haydt. The Bill Teel Memorial Modified 4-16s will again consist of four 16 lap Modified features paying a minimum $816 to win each plus lap money and contingencies. There will be an overall top finisher who will receive additional money along with a huge trophy. Drivers will draw for heat starting spots to qualify for the first feature. The next three races will be an invert for starting positions 6–20 provided all drivers are on the lead lap at the respective finishes. In-between features cars will be pitted in the staging area. Also on tap will be Late Models, Street Stocks, Dirt Mods, Pro 4s and Hobby Stocks plus the ATQMRA TQ Midgets. Kids Big Wheel races take place at intermission. The winner of the Street Stock feature will earn an additional $200 plus a free American Racer Tire. On Saturday evening, June 30, Mahoning Valley Speedway will present a tribute to the late #BillTeel. The Bill Teel Memorial Modified 4-16s will be four 16-lap features each paying a minimum $816 to win each plus there will be an overall champion named with the driver who has the best finishing average paying nearly $1000. Contingencies will be handed out too. To many Teel was the Babe Ruth of area short track pavement racing. He was admired by all who knew him from drivers to fans. He made a lasting impression on everyone he met both on and off the track. As a racer he was fierce yet respectable to his counterparts. Fans loved his smooth style of racing and it showed as he amassed a legion of close followers. When he was celebrating a victory it was commonplace to see nearly the entire grandstands empty out to join him in Victory Lane. He was also legendary for his late night race revelries too, no matter if he won or not. Teel passed away in 2012. He won Mahoning Modified titles in 1988, 1990 and 2000. He was also the 2011 Modified car owner champion with driver Tyler Haydt. His driving careen began at Dorney Park Speedway and also included stints at Nazareth Speedway, Flemington Fair Speedway, Evergreen Raceway and selected NASCAR and RoC touring events across the northeast. This will actually be the second running of the Bill Teel Memorial Modified 4-16s. The event is being organized by Dene Smith and the Teel family. Smith is a former crew member of Teel. The 16 is significant in the fact it was Teel’s signature car number and ironically when he won his last feature at Mahoning Valley on July 8, 2000, it would be his 16th. Drivers will draw for heat starting spots to qualify for the first feature. The next three races will be an invert for starting positions 6–20 provided all drivers are on the lead lap at the respective finishes. In-between features cars will be pitted in the staging area which gives fans a great look at teams prepping the cars. Last year’s show was well attended, proof of the impact Teel had in the sport. By the time race night rolled around each of the four features had paid $1116 to win. It was an instant classic. Fitting too where the winners, veterans Don Wagner, Bobby Jones, Todd Baer and John Markovic who scored the respective victories. Each raced and had fond memories of Teel as they came up through the ranks. Wagner also merited the champion title for his best overall finish and took home an additional $1116. With only 16 laps to get things done there was little time to ponder the right moves. Drivers had to act quickly in order to gain positions and none more so than that of the lead. Each race would have that intenseness for the top spot and outcome, reflective of how Teel raced, smart, decisive and to the point. In race one Troy Bollinger had the pole and would lead early on. But there would be an onslaught of competition bearing down on him, Ron Haring Jr., and Wagner especially. On the sixth lap Wagner motored by Haring and two laps later made a swift dash by Bollinger for the lead and eventually the win. In race two Joey Jarowicz was on the pole and primed to get his career first Modified win after coming close several times. He would get the lead but was immediately pressured by Jones and Kris Graver. Jarowicz was not giving in despite cars on either side of him. However, while exhaustedly defending his spot, Jones executed an outside pass while Jarowicz was holding back Graver. There was five laps to go by then and Jones was now the lead defender and held back Jarowicz for the victory. “I really wanted to win one of those features. Billy was a good friend and I miss him every day and I think a lot of people miss him, which was evident by the great turnout. I learned so much of what I do here from him. The most significant thing was how to act. He was a very classy person and he taught you how to behave,” said Jones. For the third feature the redraw put Baer on the pole and once again when the racing commenced things got right down to business in a furious fashion. Baer was in tough company as Brian DeFebo was making a bold effort to drive by him. Baer would not waver as he led the distance and squeaked out a mere .083-margin of victory. “Dene Smith put a lot of work into this event and I felt I wanted to jump on board too. It was a blast and I hope this is just the first of many more Bill Teel Memorial races to come,” offered Baer, who came onboard as a co-sponsor. In the finale it would be the always classy Markovic winning a race in honor of an equally classy guy. Markovic would get the jump at the start over Kevin Graver Jr., who had a slight hiccup when the action commenced. That enabled Markovic to seize the moment and he would be solid through all 16 laps, netting his first win since 2014. “Bill was a great guy, a great competitor and great person all around,” said Markovic. “We love what we do here and it’s a tough sport. There no field fillers anymore, everyone is top of the line. And here at Mahoning Valley all these guys run fair together, it’s always a nice place to come and race,” noted Markovic. Taking the four race best finish average to determine the overall champion, Wagner bested DeFebo and the rest of the field for the added bonus money and trophy. “It’s just an honor. Bill Teel was a great guy who I was lucky to race against quite a bit over the years. I learned a lot from him too. Guys like him are the ones you always admired and I was lucky to have known him,” said Wagner. The Bill Teel Memorial Modified 4-16s will get underway at 6:00 pm with heat qualifying. Also on the card will be the ATQMRA TQ Midgets plus Late Models, Street Stocks, Dirt Mods, Pro 4s and Hobby Stocks. For a fifth time this season rain has put a halt to racing at Lehighton’s Mahoning Valley Speedway. The National Weather Service has forecast showers and thunderstorms throughout the day and into the evening leaving little chance of any on track activities at the paved ¼-mile oval. Looking ahead to next Saturday, June 30 the speedway will present the second running of the Bill Teel Memorial Modified 4-16s. The Bill Teel Memorial Modified 4-16s will again consist of four 16 lap Modified features paying a minimum $816 to win each plus lap money and contingencies. There will be an overall top finisher who will receive additional money along with a huge trophy. Also on tap will be Late Models, Street Stocks, Dirt Mods, Pro 4s and Hobby Stocks plus the ATQMRA TQ Midgets. A rain date of July 21 is in place if need be for the Teel Memorial. Promoter Jack Carlino has also announced that the winner of next week’s Street Stock feature will earn an additional $200 plus a free American Racer Tire. Carlino noted that other such division incentives will be offered as he is grateful for the support by all race teams that have been in attendance while under his first year of as the head of the speedway. Carlino has also announced that the track is available for practice rental on either Friday’s or Sunday. Teams can rent the track for up to four hours at $150 per car (maximum 10 cars). (LEHIGHTON, PA. 6-11-18) Mahoning Valley Speedway is proud to announce that the second running of the Bill Teel Memorial Modified 4-16s will be held on Saturday, June 30. Teel passed away in 2012. He won Modified titles in 1988, 1990 and 2000. He was also the 2011 Modified car owner champion with Tyler Haydt. During his driving career, that began at Dorney Park Speedway and also included stints at Flemington Fair Speedway, Evergreen Raceway and selected touring events, Teel was one of the most respected drivers both on and off the track. He won his fair share of features and more so made a lasting impression with everyone who met and knew him from his outgoing demeanor. The Bill Teel Memorial Modified 4-16s will again consist of four 16 lap Modified features paying a minimum $816 to win each plus lap money and contingencies. There will be an overall top finisher who will receive additional money along with a huge trophy. Drivers will draw for heat starting spots to qualify for the first feature. The next three races will be an invert for starting positions 6 – 20 provided all drivers are on the lead lap at the respective finishes. In-between features cars will be pitted in the staging area. This will be a non-point race, however there will be “show-up” points towards the regular season standings. The 16 is significant in the fact it was Teel’s signature car number and ironically when he won his last feature on July 8, 2000, it would be his 16th. Last year’s event far and away lived up to all of the pre-race hype as was to be expected. The unique 16-lap feature format was well the supported by racers and fans. With only 16 laps to get things done there would be little time to contemplate the right moves. Drivers had to act quickly in order to get positions and none more so than that of the lead. Each race would had that intenseness for the top spot and outcome. There will be commemorative tribute t-shirts available for pre-sale. Last year over 300 where purchased. Anyone wishing to order a t-shirt or sponsor a lap can do so by contacting Dene Smith at 610-392-8653. Also on the card that evening will be Mahoning’s Late Models, Street Stocks, Dirt Mods, Pro 4s and Hobby Stocks plus the ATQMRA TQ Midgets. Race time is 6:00 pm. A rain date of July 21is in place if need be. (JUNE 15 2018) Soon after Kyle Strohl had a spirited battle with Lou Strohl for the race lead in the headline Modified feature, he then put the race away, powering to a decisive second 2018 victory. Starting fourth, K. Strohl utilized a lap two restart to get by Nick Baer and then zeroed in on L. Strohl. Once there the pair engaged in a torrid lead fight. Side-by-side they ran with an occasional bump or two. With K. Strohl on the outside line, he was slowly creeping ahead by the start of lap eight. Once that circuit was completed he put his nose just upfront. After finally clearing his way he then put his No. 44 into overdrive and was never challenged en route to a ninth career Modified win and 32nd overall. “The car was working so much better tonight then the past few weeks and I can’t say enough thanks to my crew for all the hard work they’ve put in,” said K. Strohl. “I really have to give a shout out to Lou Strohl for racing me so clean. I know it was a little rough at some points and I’m sure it looked pretty heated from the grandstands – I know it was from my seat.” K. Strohl was so strong that by the time he reached the checkers he had stretched his lead over runner-up John Markovic to over 3-seconds. “The season is still young and if we continue to run like this I think we can make a good statement towards the championship,” he surmised. Markovic himself was having an outstanding run. At mid-race he unseated Earl Paules for second spot and like K. Strohl was able to pull away from the pack, however, the race leader had already been checking out, leaving him to settle for a solid second. “We stumbled across a couple little things that really turned this car around the past few weeks and it’s been really beneficial,” said Markovic, who has been very fast of late. “That kid (K. Strohl) is such a good talent and an all-around good kid and I’m glad to see him win. I was trying to run him down but it was obvious it wasn’t going to be enough so I knew it was best to just hold my line and settle for second.” Point leader Brian DeFebo, who turned the fastest lap of the race, was third, almost two seconds behind Markovic. Gene Bowers had another strong outing in taking fourth while Bobby Jones rounded out the top five. Frankie Althouse parleyed his outside front row starting spot into his second Late Model win of the season. Althouse jumped ahead of Samantha Osborn at the outset and then set sail. Without the hassle of any cautions, Althouse was able to run hard enough to maintain his lead and hold off Mike Sweeney for the win, which was also beneficial to his current point lead. 2016 Street Stock champion Jon Moser was no match for the field on this night. Even though Jared Ahner showed the way early on, Moser had him figured out, taking the lead after just six laps. From there on it was no contest as he cruised to his first win of the year. Hard charging Corey Edelman came on strong in the waning laps and notched second spot over Cody Geist as the checkers waved. For the first time in 20 years a Wambold has won a Modified race. BJ Wambold held off Earl Paules to the checkers in the Sportsman Mod event. Wambold started from the pole and was able to fend off Paules as well as Devin Schmidt for the popular win. His grandfather, “The Legend” George Wambold, last won a Modified feature in 1997. Ricky Yetter was finally able to shake his early season woes as he picked up his first win since returning after a one year hiatus. Yetter did have a little luck come his way. Rookie Vince Fegley Jr., was leading and handily at that. Fegley was on the cusp of scoring an upset win as he confidently raced in the lead and maneuvered around traffic like a seasoned veteran. However, his great run got sidetracked with three laps to go when he suddenly veered out of line and scrapped the back straight wall. Yetter seized that opportunity and over the final lap held off fast approaching Billy Lowden Jr., for the win. Fegley was third. The Hobby Stocks had a special 40-lap feature that awarded $400 to win but prior to the start an anonymous donor added an additional $100. With the high stakes it became an exciting event, especially for the lead position. Al Arthofer was showing the way but hot on his heels was Beau Drobo. Steadfastly Drobot hounded Arthofer, finally getting the upper advantage with 12 lap to go. Once he prevailed on that task he was smooth and solid en route to his second win in a month’s time. When it comes to drama in a feature outcome you can’t beat Mahoning Valley and the Late Model show was all that and more. Jerry Miller and Broc Brown had the house on their feet during the final laps. Miller had taken the lead from Brown midway through the 25-lapper. Brown was not about to back down and despite having to hold off Paul Koehler Jr., he remained fixed on the leader. Over the final few tours it became a scorching battle as Miller protected the inside line, leaving Brown to do his bidding from the topside. The action then came to a full head on the final lap. With the checkers in sight Brown pulled even with Miller and as they crossed the stripe it would be a photo finish. After a review of time and scoring it was determined that Brown won the race. That did not bode so well with Miller as he reached out to officials in a protest and race review. As it turned out Brown was found to have an issue with his transponder in terms of proper positioning. He was then placed at the tail end of the lead lap cars and Miller was awarded the verdict. In the Street Stocks Mark Deysher has shown all kinds of speed this season, running among the leaders almost each week. This time, after inheriting the lead when Jared Ahner crashed out on lap 12, Deysher was able to seal the deal but not before a fast charging Shayne Geist made a last ditch run to the inside heading towards the finish line. Deysher was able to hold him off by less than a half car length for his first 2018 win. Mike Stofflet, the reigning Dirt Mod champion, is letting is be known that he is still the man to beat. After a sizzling duel with Billy Lowden Jr., Stofflet got the lead with six laps to go and went on to win for the third time in the last four races. The Pro 4 race was a bit of an odyssey to say the least as caution fever was prevalent. It effected just about everyone in the field with the exception of young Johnny Bennett who was able to secure the lead on lap five and then stay clear of the chaos and claim the win. In the Hobby Stocks Trisha Connolly made good use of her pole starting spot as she jumped out front from the outset and never looked back, cruising to a solid first win of the year. Mahoning Valley Speedway presented by Lehighton Ford got the month of June off to a rousing start with the always popular Fan Appreciation Night. Now it’s on to this weekend, June 9, with a six division show of stock car racing around the paved ¼-mile oval. Modifieds, Late Models, Street Stocks, Dirt Mods, Pro 4s and Hobby Stocks will fill out the card. The Sportsman Modifieds have the night off. Race time is 6:00 pm. Grandstand adult admission is $12. $2 off for students, seniors 65+ and active military. Children under 10 are free. Front gates open at 4 pm Pit gates open at 11:30 am. Early paid practice will be 12:30 – 3:30. Regular warmups start at 4:30. Driver sign-ins will be from 3:00 to 4:15. At intermission Kids Big Wheel races sponsored by Ron Haring and Chrissy Powell Modified No. 85 will take place. Please sign up at kids table located near the main grandstand gate. On Saturday morning from 9:00 am to 11:00 am and again from 4:00 pm to 6:00 pm Responsible Recycling Services will be conducting a FREE recycling drop off event. Computer, printers, CVRs, microwaves, UPS, lead acid batteries, metal items, cables & codes, laptops, phones, cell phones, string Christmas lights and more can be brought in. Coming up on Saturday, June 16 the Hobby Stocks will contest in a special 40-lap/$400-to-win main. (JUNE 2, 2018) Mahoning Valley Speedway presented by Lehighton Ford hosted its annual Fan Appreciation Night to a great crowd and equally great racing as all seven classes provided excellent showmanship. Thus far during the 2018 the top five in points has been occupied by seasoned veterans led by Brian DeFebo, then Bobby Jones, John Markovic, Earl Paules and Lou Strohl. There is a lot of wins and championships among that iconic group but next in the point’s line is 18-year old Kyle Strohl who has stayed close in their shadows and on Saturday night he showed the old masters why he is one to be reckoned with.Strohl would lead from the outset and then began to author a dominating drive as he was pulling away steadily into the waning stages of the 35-lapper. However, a caution with two to go would allow Austin Kochenash to pull in behind him for the final few tours but Strohl wasn’t about to be denied and rolled to his first win of the year and eighth time in a Modified. “We’ve been struggling the past few weeks to get the right set-up. At intermission today we hit on something and we just put all our effort into it and it all paid off,” said Strohl, who has 31 career overall feature wins, numbers that are worthy of his aforementioned mentors. Thanks to a string of nonstop laps, Strohl used that span to show his hand and was pulling away from the pack on each circuit. “I was unaware of that fact. We were just holding out line and hitting our marks. I just wanted to hold my line and hope for the best,” said Strohl. Behind him the action remained tight at Lou Strohl, Jones and Joey Jarowicz fought tooth and nail. By mid-race Kochenash was also getting in on the battle. With just two laps to go and Strohl looking home free the caution waved for DJ Wagner who backed hard into the wall off turn two and with that went away the huge lead. For the restart Jones was on Strohl’s tail with Kochenash sitting third. On the white flag lap Kochenash slipped by Jones and was then glued to Strohl’s rear bumper but his concentration remained on to the finish and he took the checkered flag by a scant margin. “My heart was beating on the restart because I knew Bobby (Jones) was behind me and you always have to be on your game with him and Austin (Kochenash) too. There’s a lot of great competitors here and they all have their act together. We were behind the eight ball but I think now we’re finally starting to get it right,” said Strohl. In the Late Model main Jeremy Miller held onto the lead all race long but by no means was it easy. With the likes of Mike Sweeney, Frankie Althouse, Matt Wentz and Broc Brown hovered in a tight pack behind him, the going was tough. By lap 10 Althouse and Brown went into a torrid two-wide battle while each making stabs at Miller. For Brown, he would be able to take control of the runner-up spot by lap 15 and then set his sights on Miller. It was intense racing between them as Miller led and Brown wanted it just as badly. So much so that with five to go Brown had the top spot while racing the high line. During this two-wide dog fight Brown squeezed down on Miller the next time by and could not hold the handle of his mount and spun. Miller then fended off Althouse and on the final lap Sweeney for his first win of the season. Whenever BJ Wambold is given the pole he has been able to make the best of it. Starting number one in the Street Stock feature he would be able to keep that spot all the way to the finish for this third time winning in the past two seasons in much the same fashion. Cory Edelman was a close second with point leader Cody Geist in third. Ray Deemer wheeled his No. 25w to a thrilling Dirt Mod win that saw him fight off Mike Stofflet to the checkers by a mere .033-second margin of victory. Deemer took the lead at the drop of the green and was pressured lap after lap by Stofflet. On the final go around Stofflet let it all hang out and throttled to the outside of Deemer coming off turn four but determination won out. Cody Kohler scored his fourth consecutive Pro 4 win. Taking the lead with an inside pass on lap 10, Kohler then let everyone else battle for the spots behind him as he motored away to an 18th division win. Although he has amassed quite a few wins, never before has he been able to reel off this many in succession. He needs just one more to tie the record of five in a row. In the Hobby Stocks it was Shawn Kistler becoming the first repeat winner of the year. Taking to the lead from the get-go. Kistler held off a very impressive Peyton Arthofer for the verdict. (MAY 26, 2018) Saturday night’s racing at Mahoning Valley Speedway was very reflective to Dorney Park Speedway as a trio of drivers with deep ties to the defunct 1/5-mile track in Allentown graced Victory Lane. John Markovic edged Brian DeFebo in a thrilling Modified feature, Kenny Hein held off a throng of on-comers in the Late Model main and Ken Erney III scored his career first win in a thrilling 75-lap Street Stock show. Markovic and Hein began their careers at “The Park” while Erney’s dad was one of the more prominent drivers who competed there. Other winners included Mike Stofflet in Dirt Mods, Cody Kohler in the Pro 4s and Beau Drobot with the Hobby Stocks. Markovic notched his career first win 38 years ago at Dorney in a Late Model. “Without racing I’d have nothing else to do. I love the sport and I’m glad to be back in Victory Lane here at Mahoning Valley.” With his runner-up register DeFebo was able to keep his point lead in tack. Kyle Strohl drove nicely to third while Bobby Jones and Earl Paules rounded out the top five. In the Late Model race Hein would start from the pole and lead the way after the opening lap. However, bearing down heavily where Mike Sweeney and Matt Wentz who ran in tight formation. Also in the front pack included Broc Brown and Frankie Althouse. That group would go lap after lap in what would turn out to be a caution free race. All the while Hein refused to waver as he kept his aim despite the onslaught. At the end Hein, who like Markovic began racing at Dorney Park in the mid-1980s, picked up a stirring win, his first in six seasons. Wentz, Althouse, Sweeney and Brown completed the front five. The Street Stocks contested in a special 75-lap/$1000-to-win run. Erney would lead the field to the race commencing green and afterwards lead for the first time in a feature race. This is Erney’s sophomore season and prior to this night had neither a top-5 nor top-10 finish. Setting the early pace it was clear to see that those marks where about to change for the better. Despite immense pressure from Mark Deysher and Todd Ahner while at the same time running two-wide with each other, Erney never flinched. His restarts where timed perfectly and played a key in his maintaining the lead. In the waning laps a fast charging Josh Mooney zipped by Ahner and Deysher and would make a strong-willed attempt on the final lap to get past but Erney was determined to not let this one slip away as he took the unforgettable first career victory. It was the first time the Erney name was in Victory Lane since Ken Erney Sr., won at Dorney in 1984. Defending Dirt Mod champ Mike Stofflet roared to his second straight win with a dominating performance. Stofflet unseated teammate Colton Perry for the lead on lap two and afterwards went into cruise control the rest of the distance. Cody Kohler rolled to his third consecutive Pro 4 win. It took the former class champ eight hard fought laps to get around early leader Bobby Kibler Sr., but once he did it was smooth sailing the rest of the way. There is nothing quite like a career first win and for Beau Drobot his came with extra special feel to it. Drobot was unchallenged for all 20 laps of the Hobby Stock win and was understandably emotional when standing in Victory Lane as it was the first time winning in s stock car since his dad, Nimmy Drobot, passed away some 10 years ago. Late Models at Mahoning Valley Speedway have been a staple for decades. Some of the best asphalt Late Model racers have and still compete at the demanding paved ¼-mile oval in Lehighton. Mike Sweeney, who is the two-time and defending champion has been the leading Northeast asphalt Late Model winner the past three seasons. Four time champion Paul Koehler Jr., is the all-time wins leader in area pavement wins. Frankie Althouse has been carving his own niche right alongside those two. There are others as well like most recent winner and up and comer Broc Brown. The always steady Jeremy Miller, respected veteran Kenny Hein and hot shoe Jacob Kerstetter to name a few of the current stars who race Mahoning Valley. Track management is proud of their Late Model group but would also like to invite all area/regional/touring asphalt Late Model racers to be part of #MAHONINGNATION action. With a simple weight adjustment, either left side or total, the track will allow Late Models built to different track/series rules to compete. Race Director Steve Fox is ready to answer any questions that any competitor might have and can be reached at sfox@mahoningvalley-speedway.com. On Saturday, May 19 at 6:00 pm Mahoning Valley will host a six division show which includes Modifieds, Late Models, Street Stocks, Sportsman Modifieds, Pro 4s and Hobby Stocks plus the Flashback Stocks will join the card. (Dirt Mods are off). At intermission a Little Tykes Bullring Enduro will be held for the kids. Grandstand adult admission is $12. $2 off for students, seniors 65+ and active military. Children under 10 are free. Front gates open at 4 pm. Coming up on May 26 will be a 75-lap/$1000-to-win Street Stock feature and the following Saturday, June 2 will be the always anticipated Fan Appreciation Night with a special $8 grandstand admission. Please note that this night begins one hour early at 5:00 pm. (MAY 5, 2018) Mahoning Valley Speedway had an evening of racing that the late promoter Ward Crozier Sr., would have been proud of. On a night that paid homage to his legacy, the pits had nearly 100 race cars, the grandstands where buzzing with enthusiastic fans and the racing was action filled across all seven divisions. It fit perfectly into the style of Crozier and his concept of how racing should be held at his beloved Mahoning Valley Speedway, the paved ¼-mile oval that he brought back to life in 1987. 31 years later and the same formula changed very little. As part of the tribute all features where run as 26-lappers which was reflective of Crozier’s racing days and his signature car number. Bobby Jones of Palmerton got his start in racing thanks to the kind outreaching of Crozier nearly 30 years ago. Fittingly Jones was humbled when he scored a wild Modified victory, his second in a row. Jones’ first ride in a race car was aided when Crozier offered up a driver’s suit. “I said I had to win this tonight because of him (Crozier) I’m still doing this today,” offered Jones. And, the outcome was just as much a surprise to Jones as was everyone in attendance. DJ Wagner was leading and looking unstoppable en route to a career first Modified win. However, with six laps to go light droplets of rain moved in and prompted the caution. The field remained on the track in order to keep the surface in tack. While touring under the yellow, Wagner abruptly exited the track and yielded the lead over to John Markovic. The driver’s where then asked to relay to officials if the pavement was good to go back green as the rain halted and the answer was all thumbs up. When the race resumed Markovic had Lou Strohl on his tail while Jones was third. If the surprise of Wagner exiting wasn’t enough of a blow, no sooner did the first lap get underway the race took another wild turn. In corners three and four Markovic suddenly drifted high and made slight side contact with Strohl who was hustling for the lead. The lane opened up wide enough that Jones dove to the bottom and a thrilling three-wide pass for the lead ensued. “It was a bit weird how everything just fell in place. Johnny (Markovic) went up and got into the 88 (Strohl) and the door opened up and I wasn’t even ready for it,” explained Jones. For the remaining few laps point leader Brian DeFebo leaped into second and hounded Jones to the checkers. “When they asked us to give a thumbs up or down I had mine up, I felt we really never lost the track. I didn’t realize he (Wagner) got off at first. No one ever told us to get off and to just keep rolling,” recalled Jones about the wet condition situation. “I didn’t realize he did it at first. Honestly I think he would have won the race. The track was fine after we restarted.” Earl Paules, Todd Baer and Markovic completed the top five. Jones has been on a roll winning his fourth feature in the last six races dating to the prior season. “Four of the last six races going back to last season. I’ll take that. Right now we got it going on and I’ll ride it out as long as we can,” Jones said after picking up his 39th career win. Broc Brown blasted by Jacob Kerstetter on lap seven and then cruised dominantly to his first Late Model win of the season in a caution free race that was over in just under five minutes.